After reading the book by Dr. Becky Bailey this summer, I began the first leg of my CD journey this school year. I was totally absorbed by the book all summer long and it was really an "awakening" for me. So, if you haven't read this book, I highly recommend that you do...and soon! It really is "Discipline for the 21st Century." The book really caused me to reflect on how I respond to "behavior problems" in my classroom and to think about more brain friendly ways to help students to successfully cope with the daily stresses of life, so that they can move on to accomplishing greatness in the classroom. I was thrilled to find out that Dr. Bailey has also come out with a "sequel" to the original book that has more of the "nuts and bolts" of how to implement CD in your classroom...right now! Most of you are probably familiar with the ideas in the book, so I really wanted to talk today about some of the little ways I have begun to use CD in my third grade class this year. The first week of school we all made "mini-me" necklaces. We put these on each morning as we come into the classroom. As we gather for our morning meeting, students place their necklace into our Safekeeper Box. If any students are absent, we hang their necklace on the Friends and Family Tree and together we wish them well. I then "tuck everyone in" and close the lid on the box and proclaim, "My job is to keep you safe, and your job is"....and they then chime in "to help keep it safe!!!" Wash, rinse and repeat every morning!! This is a quiet place in the classroom where any student can go when they need a place to calm down and gather their thoughts. I simply used a privacy screen and placed it on a table in the back of the room. On it I have displayed picture cards for some of the CD strategies that are taught early in the school year, such as S.T.A.R. breathing and other relaxation techniques (the balloon, the pretzel). I also have the VERY IMPORTANT "Cranky Cream", which is just hand lotion. My kiddos LOVE this. Honestly, they use it all the time...not just when they are cranky. I like that our Safe Place is portable and can be moved to different locations as needed. I have a job for every student and we change them out every week. In addition to the usual jobs you might find in a third grade, we've added the Healthcare Worker (retrieves band-aids and takes sick friends to the office), Heartcare Worker (cheers up a student who needs cheering up), We Care Chairman (in charge of making cards for celebrations and special events such as birthdays, sick/absent students﻿, or a student who is leaving us), and The Noticer (he/she is on the look-out for random acts of kindness and adds a bead to a jar every time they "notice"), and The Greeter (gives friendly greetings to students as they enter the classroom in the morning and greets visitors). I am loving Conscious Discipline so far and I know my students really appreciate having a calm, and composed teacher (who takes a lot of deep breaths throughout the day). I also have every hair on my head still intact....very impressive for November, I think!! 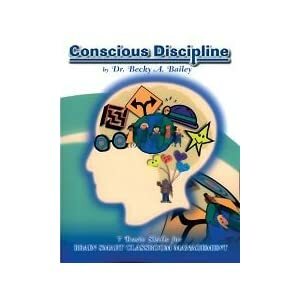 What are your favorite Conscious Discipline ideas??? OMGoodness Kathy! I am a HUGE CD fan and have blogged about it since I first started my blog. It is amazing! I love the CD School Family jobs. My favorites are the Cheerleader, the Kindness Recorder, and the Greeter. One of the most amazing parts of CD is how it teaches children to use their big voice and stops tattling. My kiddos are excellent at noticing and we have even tied in Bucket Filling up having a School Family bucket that we fill with helpful hearts (heart beads). My kiddos will go to each other and say "I am going to add you a helpful heart for ___________________." And the child that is having the heart added for them says "Thank you for noticing that." It is so sweet and it gives them the ownership of recognizing and celebrating the helpful and kind acts of others. At the end of the year, everyone makes a helpful heart bracelet to remind them to always be helpful and kind even when they are no longer with this school family. My favorite thing about CD is how much it has changed and helped me. Knowing that I cannot change anybody but myself and that I need to be the person I want others to become is so powerful. I have been using CD for almost 6 years now. I have moved away from judging and say "I like the way...." to "I notice that .....". YOU have actually been so helpful already. I have read many of your past posts and they were SO helpful in getting me started!! Thank you for your thoughts today!! Hi Kathy- I'm your newest follower! Thanks so much for stopping by our new blog. I love your safe place/family tree spot in your classroom- what a great idea! Thanks Aylin!! I am so excited that you visited!! I think we are going to e great bloggy pals!